Most of the fancy things you can do with the Samsung Galaxy Note 3’s S Pen are easily accessed by using the Air Command dingus. 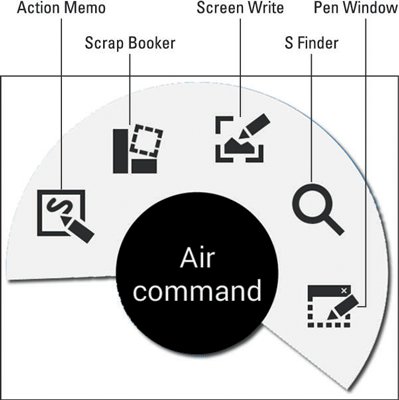 Air Command appears whenever you remove the S Pen from its launching tube. You can also make it appear by pointing the S Pen at the touchscreen (you don’t need to touch the screen), and then clicking the S Pen button. Action Memo: Choosing this item opens the Action Memo window, in which you can jot notes. The notes are accessed from the Action Memo app, found in the Samsung folder on the Applications screen. Scrap Booker: This feature allows you to copy chunks of the screen into the Scrapbook app. The chunks are graphical images, not the information you’ve circled by using the S Pen. Screen Write: The Screen Write command takes a picture of the screen — a screen shot — and then lets you draw in it by using the S Pen. The saved images can be accessed from the Gallery app. S Finder: Use this item to search your tablet — or the Internet — for specific tidbits of information. Pen Window: After choosing this item, draw a rectangle on the screen, and then choose a mini-app to appear in the rectangle. Only a handful of apps are accessible through the Pen Window. If you don’t see the Air Command gizmus, ensure that it’s activated on your Galaxy Note: Open the Settings app, found on the Applications screen. Touch the Controls tab and ensure that the Air Command item’s master control switch is in the On (green) position. If it isn’t, slide the master control icon to the left.